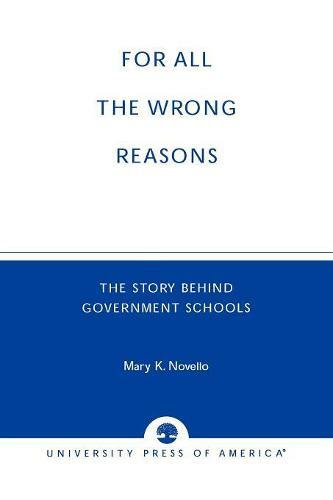 All the Wrong Reasons reveals the historical, political, and philosophical route which has formed today's government school system and argues for separating education from the state. It explains that the establishment of government schools grew out of nationalistic movements which took place in western culture during the nineteenth century due to the desire for freedom. The author discusses the major influences on the development of contemporary education including progressivist educational innovators such as John Dewey, Bronson Alcott, Leo Tolstoy, Friedrich Froebel, and Johann Pestalozzi as well as their predecessors in romantic philosophy Georg W.F. Hegel and Jean-Jacques Rousseau. She examines the collectivist philosophy, rooted in Marxism, present in the educational system and how these philosophies promoted self-absorption and self-revelation which have led to a coercive and monopolistic government school system.